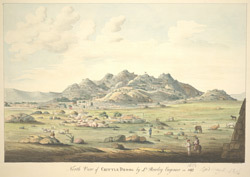 Water-colour of the hill-fort of Chitradurga by John Newman (fl. c.1795-1818) after George Rowley (fl. 1797-1803) in 1803. Inscribed on the front in ink is: 'North View of Chittle Droog by Lt Rowley, Engineer, in 1803. J.G. Newman delt'; in pencil: 'Copied, May 11, 1816.' Ensign George Rowley served with the Madras Engineers from 1797 to 1803 and assisted MacKenzie. Chitradurga or Chitaldrug is situated in Karnataka at the base of a cluster of hills covered with extensive fortifications. There are inscriptions of the Chalukya, Ballala and Vijayanagara dynasties on the site. The foundations of the existing fort were built by the Naik Pallegars in the 17th century and modified by Haidar Ali and Tipu Sultan in the 18th century. Tipu Sultan built the Kallina Kote (Palace of Stone) within the walls which was later used as a courthouse. The fort had 19 gateways, 38 posterior entrances, a mosque, granaries, oil pits, four secret entrances and water tanks. It was approached by a winding entrance which made it more difficult for attackers to get through. Many temples are situated in the rocky surroundings which make up the interior of the fort complex.